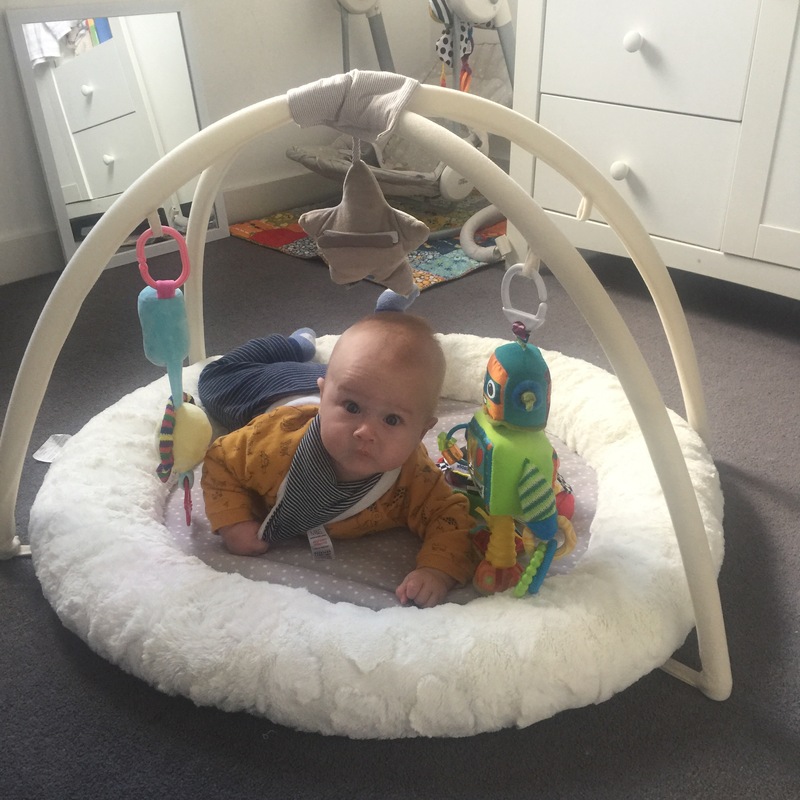 It can be difficult to know what to do with your baby once they hit five months old. They may not yet be able to sit unsupported and yet they are desperate to do more playtime activities. 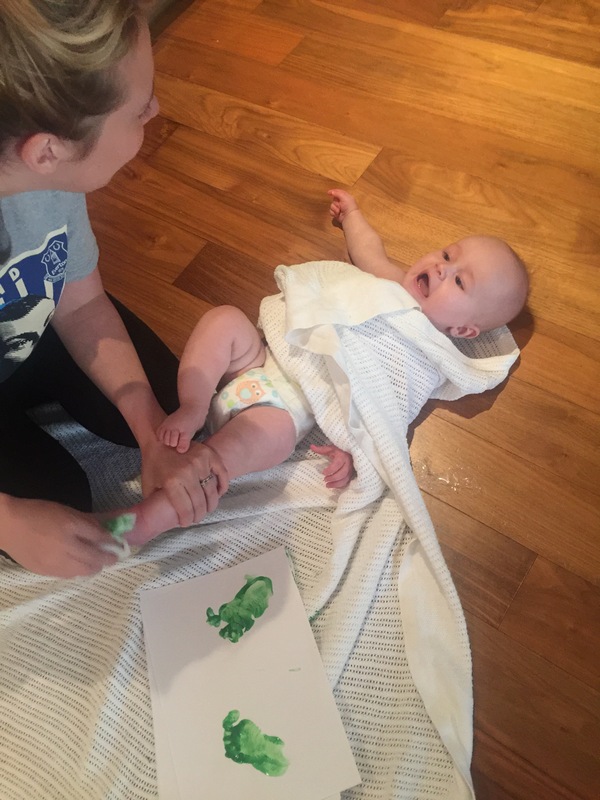 This article discusses the 5 month baby activities we got up to when Dex was a five month old baby. We will be trying all these again one Felix turns five months old! To encourage tummy time my friend Samantha inspired us to try this. I filled an oven dish with water and put some ducks in it. Dexter tried to grab at the ducks and splash his hands in the water. It was a great sensory experience for Dex while developing those important neck and arm muscles. 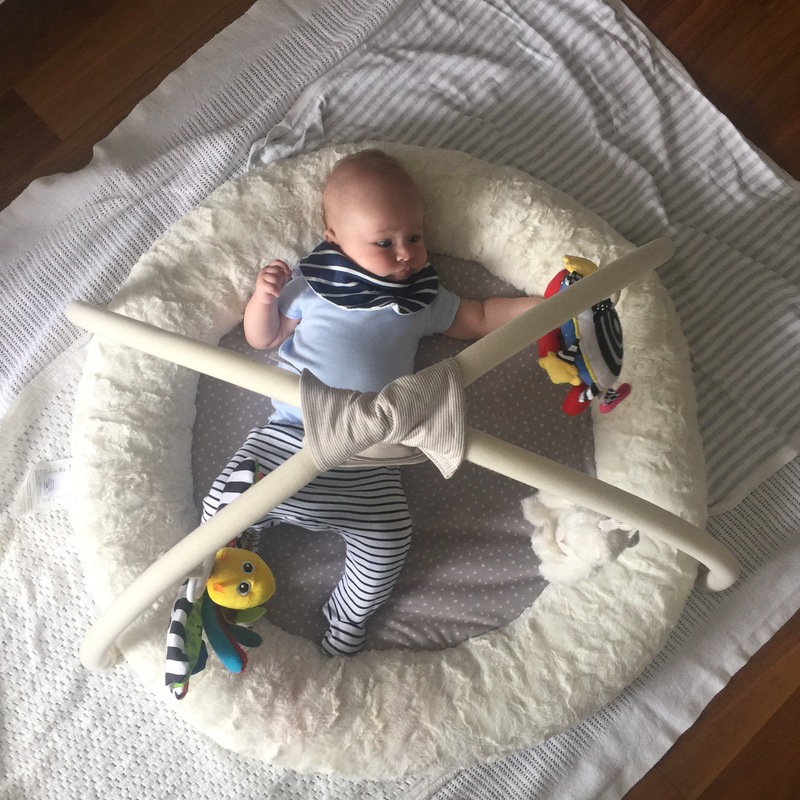 Another fun way to encourage Tummy Time is to invest in a lovely plush play mat, ours is from Mamas & Papas.You can dangle all sort of toys from it which helps baby with his neck movement, giving him the strength needed to one day sit up, crawl and walk. Dexter loves reaching out and grabbing he toys and rolling from front to back to front again. Here, he is playing with his Lamaze Rusty Robot. 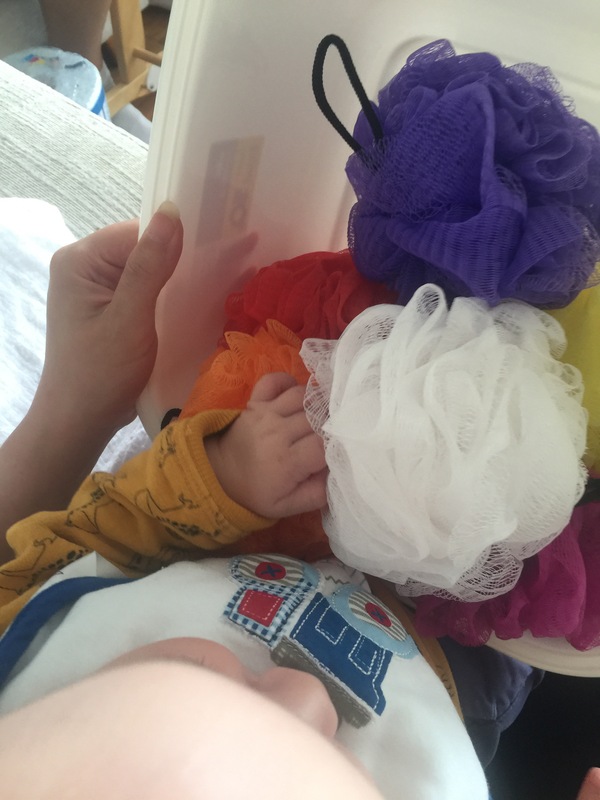 A fab toy with lots to see and do.He likes to grab hold of it and give it a good talking to! During Leap 4 the Wonder Weeks app encourages you to invest in an activity centre and it was the best thing we did. This is the Baby Einstein Around the World activity centre. It keeps Dexter busy and gives me five minutes to sit down next to him and have a hot cup of tea. He hasn’t yet learned how to use every function yet so there is always something new to learn. Look at the concentration on that face! I read online that to encourage crawling you could try some tummy time on a laminate floor. Because it’s more slippery than a carpet, babies might move and suddenly understand what they need to do to crawl. Anyway, I thought it was worth a try. I’d always avoided putting Dexter on the laminate floor before. I guess I thought if he face planted he would need the soft carpet to land in. As you can see, his arm strength is very good and face plants are very rare. 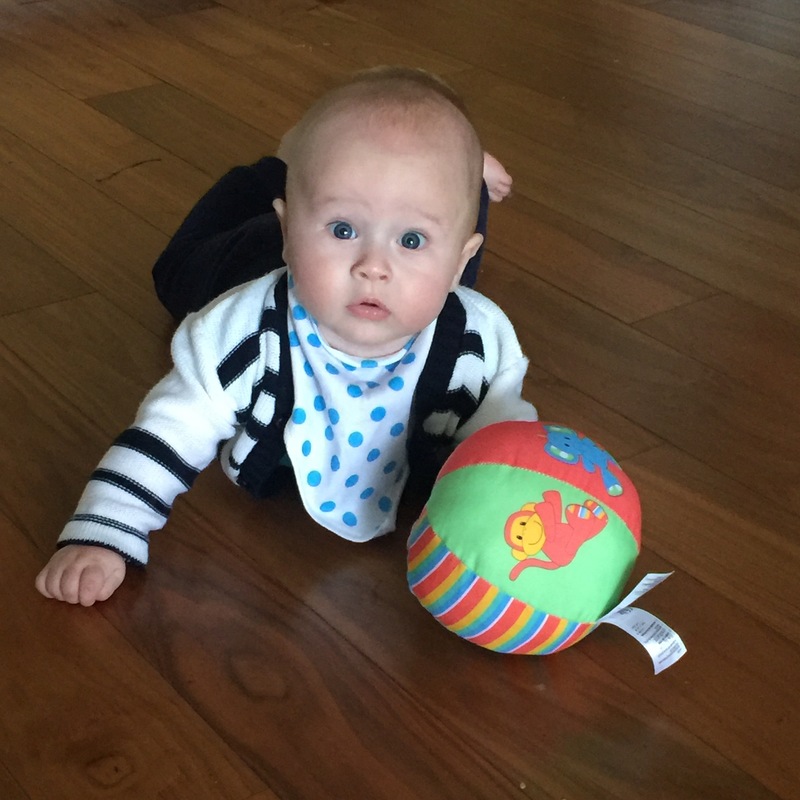 I also used his Early Learning Centre ball to encourage him. He adores this ball because of the bright colours and the noise. When it rolls out of his reach he really tries to move towards it. 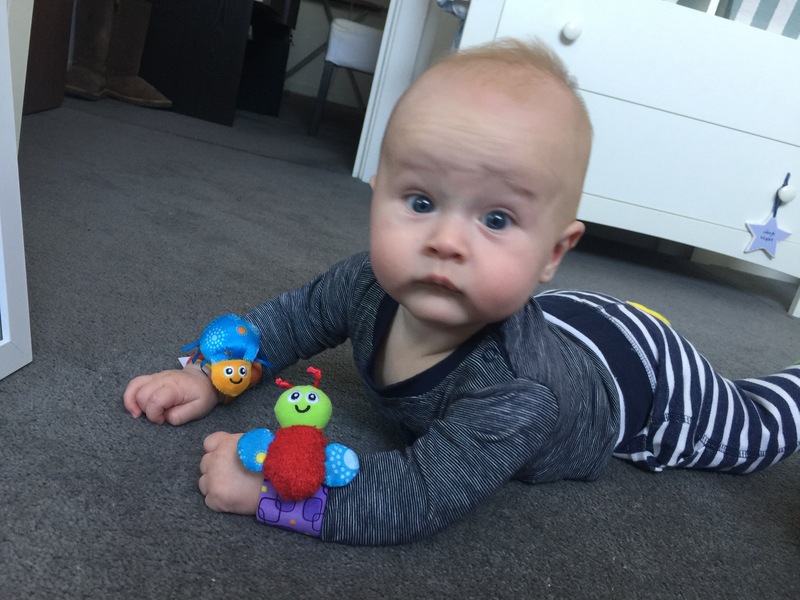 He’s not quite ready for crawling but there is no harm in letting him practise and building the muscles he will eventually need. We are told about Tummy Time all the time but we also shouldn’t forget to give baby some back time. This will encourage him to move his neck from side to side and give him the opportunity to roll from back to front. 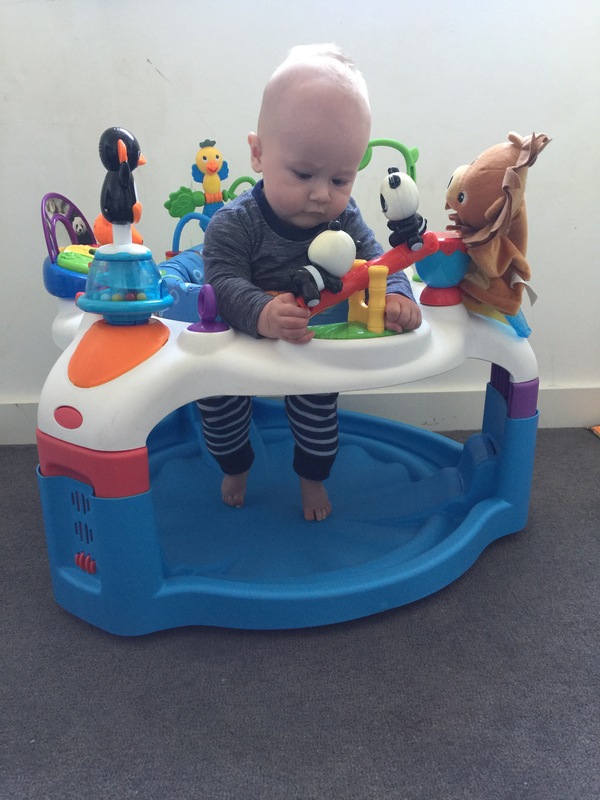 Here he is on his play mat again with a few toys to encourage neck movement. One of them is the wonderful Whoozit. When Dexter was a newborn it was all a little bit too much for him, now that he’s older, he loves the stripes and the rattles. I search on Pinterest a lot for sensory ideas for Dexter and one which was cheap and easy to do is below. I bought a washing up bowl and filled it with different coloured shower puffs. He loved the texture of the touch and the bright colours. Now he’s a bit older he also like to pull them out of the bowl one at a time. Simple but effective. A fun activity for the whole family. We bought some child safe paint from Wilkos and set to work capturing his feet to create pictures to give to family. At first I tried to make some edible paint out of baby rice and food colouring but it didn’t really work. As long as you have wipes handy to clean the feet before he attempts to put them in his mouth you’ll be fine! We took some foot prints then my husband and I turned them into witches by adding hats and broomsticks. If you like this post then check out more activities for your baby here. Getting ready for your weaning journey? Read all about our baby led weaning journey during the first weeks here. and if you are worried about choosing baby led weaning, get all your concerns answered here. Liked the water and duck idea. Will try it.